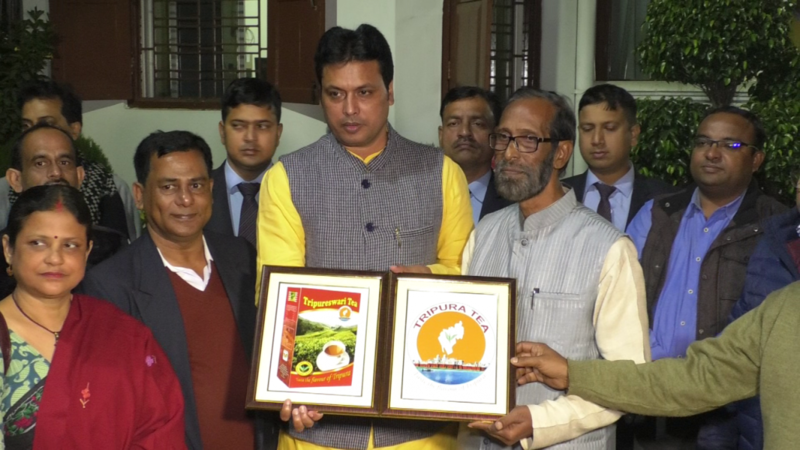 Giving a facelift to the tea of Tripura, State Chief Minister Biplab Kumar Deb on Saturday unveiled the official logo of Tripura tea and released a tea brand – Tripureswari Tea. Speaking on the occasion, Tripura Chief Minister Deb hoped that the new logo and the branding would help in reviving the loss-making tea industry of the State. The branding will also help in its marketing, said deb. The State at present has more than 50 tea estates besides hundreds of small tea gardens. The tea industry in Tripura started over 100 years ago, in 1916 with the Hiracherra tea estate in the northern part of the State when the State was ruled by the king. Deb informed that his Government has taken initiative of exporting tea to Bangladesh which imports it from Sri Lanka and in this regard, he has already written to both the Governments of India and Bangladesh. The Tripura Chief Minister informed that Tripura tea from the coming plugging session will see significant quality improvement and the new logo of Tripura tea, which has Lake Palace Neermahal incorporated in it will also help in its marketing in the tourism sector. Tripura has 54 operational tea estates, out of which 42 are individually owned, 13 are operated under cooperative societies and 3 are run by the Tripura Tea Development Corporation (TTDC). Currently, around 6,885 hectares of land area are under tea cultivation in the State.